Happy Friday! We’re kicking off a long weekend here, and I’m so looking forward to catching up on some yard work (if weather permits), as well as taking some time to recharge after a busy couple of weeks. What about you? It’s been raining on and off for the last 2 days, making our grass and trees really green up- yay! Our spring was late arriving, but it looks as though it was worth the wait. I was worried about my perennials by the front porch surviving the winter, but I’m happy to report all is good! 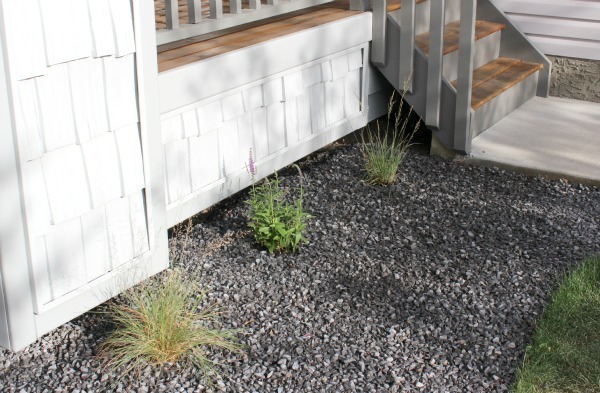 The ornamental grasses and atomic lilac are supposed to get at least a few feet high, filling the front porch area in and softening the hard edges a bit. Now I just need to finish up the decorative details I didn’t get to last year before the cold weather hit. Perhaps a chair or bench, and definitely a rug and some potted plants. That’s on the top of my to-do list for this weekend. A big thanks to all of you who joined our Plants & Flowers link party as part of the Outdoor Extravaganza. I’m definitely inspired to plant a raised bed garden next year! There’s still time to share a project of your own. Did you see my strawberry pot used as an herb garden? 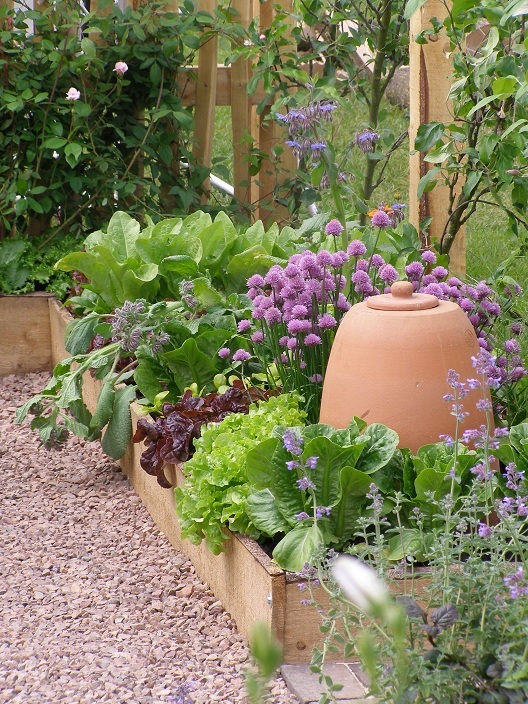 I love this kitchen garden spotted on Crocus! The Outdoor Decorating portion of the series is on Wednesday, so get busy sprucing up your front porch, deck, backyard or any outdoor space this weekend! I’ll be thinking of you. I’d love for you to share what you’re up to in the comments! I love this series so much! We’ve been working hard on our front flower beds (I actually made them smaller because the space was more than i could handle). Thanks so much for the great inspiration! Happy Victoria Day long weekend Shauna, enjoy your time in the garden! I spent this week planting my herb and lettuce bed. I planted lavender for the first time and I’m so happy about it! I don’t think my lettuce will look as nice as the one pictured above…..I’m starting to wonder if it ever will. I hope our rain goes away so I can get the patio ready!!!! I was going to see if I could get a new patio set but who knows where we will end up living. i think I might re-cover the patio cushions. Looks like we both had the same idea. I finished planting my garden this weekend (glad I waited with all the cold weather), planted some flowers and grass seed. Can’t wait to see your after pictures. My kitchen refresh is still on my list of things to do. Wow this looks great. You’ve given me a few great ideas. I recently bought a few outdoor lanterns and they really make our back porch look fantastic. Thanks for the post.